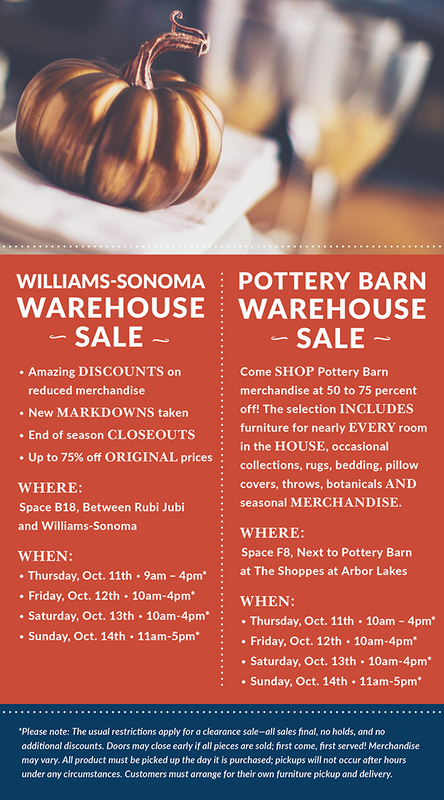 Three warehouse sales are happening this week and next--Pottery Barn/Williams-Sonoma and Stroke of the Heart greeting cards. Pottery Barn will have its warehouse sale Oct. 11-14. All merchandise will be 50 to 75 percent off, including furniture, rugs, bedding, pillow covers, botanicals and seasonal merchandise. All items, including furniture, must be picked up on day of purchase. The sale is in a space next to Pottery Barn at Shoppes at Arbor Lakes at I-94 and Hemlock Lane in Maple Grove. Williams-Sonoma, part of the same company as Pottery Barn and also in Arbor Lakes, has a similar sale with new markdowns and closeouts. It's being held in space B18, near the Williams-Sonoma store during the same hours as the Pottery Barn sale. Stroke of the Heart, a 35 year old Twin Cities-based company, is having its last warehouse sale Oct. 17-20. It is closing its doors due to the owner's retirement and declining sales of greeting cards. "It's a hard business to be in as more people use social media and emailing to stay in contact," said Kristin Noraker, chief operating officer. Hours are 10 a.m. to 4 p.m. Thurs.-Sat. and 11 a.m. to 5 p.m. Sun. The company's main lines of cards have been sympathy, serious illness, get well, encouragement and pet loss. Many of those card themes, all designed and made in Minnesota, were inspired by Noraker's mom Kevyn Riley, the founder and co-owner. Riley is a registered nurse and a cancer survivor. The sale, larger than previous ones, will include mostly cards and not as many ancillary products such as kitchen magnets. All greeting cards will be 50 cents. The sale is at a new location at 10136 W. 76th St., Eden Prairie, 952-945-9495. Hours are noon to 8 p.m. Oct. 17-18., noon to 6 p.m. Oct. 19., and 10 a.m. to 2 p.m. Oct. 20.